MANUFACTURING AND INSTALLING THE FINEST QUALITY ACOUSTIC MOVABLE WALLS AND SLIDING FOLDING PARTITIONS THROUGHOUT THE UK SINCE 1978 - ALWAYS WITH A 3 YEAR GUARANTEE. Have you ever wished for meeting room, conference room or training room that you could divide to accommodate those last minute bookings by small groups? Would you benefit if an area within an office, meeting room, hall or classroom could be divided to accommodate smaller, separate meetings? Pellco offer made-to-measure movable acoustic partitions which can solve these problems. Since our incorporation in 1978 we have carried out partition installations, often in the most demanding circumstances, for clients including literally hundreds of schools and churches, and almost every type of financial and commercial institution in the United Kingdom. We offer a wide range of movable walls as well as expert installation seven days a week. A leading manufacturer since 1978 – we install throughout the UK, offering a complete package of supply and installation. With no other trades required, you can be assured of minimum disruption to your workplace. We operate all over the UK and undertake our own decorated frame and support work, acoustic baffles within ceiling voids created. We offer a complete package of supply and installation – no other trades required. We clear up and clean work area, ready for immediate use, taking away all rubbish and packaging. We calculate careful and fair prices – remember, we want your business. We install seven days a week, minimum disruption to your workplace. (Manufacture in four weeks). We offer a choice of products to suit all practical needs and all budgetary requirements. We offer a three year parts and labour warranty on all installations. Pellco sliding partitions and movable operable walls are perfectly designed to for space division and can be used to separate meeting / conference rooms. The benefit of room dividers is the greater flexibility of room use and the creation of a more versatile, productive and profitable area. We undertake our own installation with minimum disruption to your workplace. Weekend and evening work is the norm in our specialised industry. The first step in response to your enquiry would be for us to visit and carry out a careful survey. We would discuss the intended use of the space to be divided, reaching a specification of finish and acoustic performance in either a sliding acoustic partition or movable operable acoustic wall that would represent best possible value for money. Exceptional design – Ease of use with a World of possibilities. The movable wall Palace 110S is able to satisfy the most stringent requirements a user could demand from a high end system. The Palace 110S has excellent acoustical properties. When it comes to sound insulation, the Palace 110S is the obvious choice. Although the panel thickness of the Palace is only 110 mm, its sound insulation value measures within a range of between 37-58 dB Rw. The Palace runs smoothly along its track system by means of ball-bearing trolleys and has almost unlimited stacking possibilities. As a result the Palace 110S is an obvious choice, whatever the specification demands. All our walls have been designed to eliminate the need for floor tracks or guides. A manually operated spindle mechanism, in combination with top and bottom, acoustic pressure seals, ensures the greatest stability and highest degree of sound-proofing. The Palace 110S is made up out of various different panels options. These panels can be finished in a variety of different styles and finishes. Because of its metal self-supporting frame construction, a height of more than 15 metre can easily be reached by the Palace 110S. This will enable you to design a wall that meets your requirements entirely, both technically and aesthetically. The Palace 90 is a versatile and robust choice. The optional inlayed aluminum panel connecting profiles give it a neat and stylish look. In spite of its 90 mm thick panels, the Palace 90 incorporates an extensive package of functional characteristics. For instance, the acoustic properties of this wall are able to achieve a 48 db. sound attenuation. The Palace runs very smoothly along its track system by means of ball-bearing trolleys and has almost unlimited stacking possibilities. Therefore the Palace 90 is an obvious choice, whatever the specification demands. All our walls have been designed to eliminate the need for floor tracks or guides. A manually operated spindle mechanism, in combination with acoustic pressure seals, ensures both stability and a high degree of sound attenuation (37 – 48 dB Rw). Fire retarding panel facings are an option on request. This 80 mm wall system offers a combination of performance, quality of manufacture and outstanding value for money. The Palace 80 panels runs very smoothly along its track system by means of ball-bearing trolleys and again has almost unlimited stacking possibilities. With a panel thickness of only 80 mm, the panels will take up a minimum amount of space in parked position. The trolleys used to move the panels are suspended from a powder coated White (or coloured) multi-profile Aluminium head track. This track incorporates suspended ceiling support trims to ensure the neatest possible ceiling/track appearance. The Palace 80 is practical, easy to operate and carefully priced. All our walls have been designed to eliminate the need for floor tracks or guides. A manually operated spindle mechanism, in combination with acoustic pressure seals, ensures the greatest possible panel stability and a high degree of sound attenuation. (36 – 44 dB Rw). Fire retardant panel facings are an option on request. The panels have been constructed using a solid Aluminium perimeter frame, which contains a sealed, double glazed safety glass. This will enable a room’s spacious and light sense of proportion whilst providing desirable features such as high sound insulation and a beautiful design. This perimeter panel frame can be supplied in any RAL colour. The Transpalace is also available with fire-resistant glass. Our walls can meet high fire safety requirements. Using the Transpalace wall allows people to create an open and well-lit environment, whilst maintaining the high-quality features associated with the Palace, including excellent sound insulation and a modern, functional design. 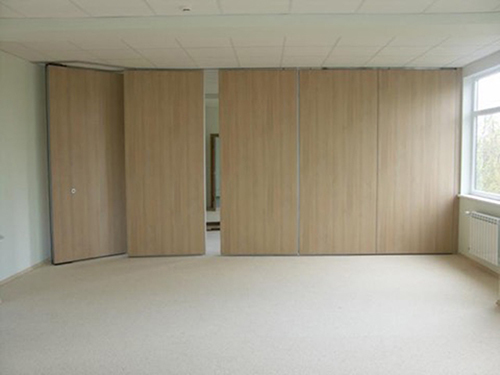 Our top-hung partitions are a robust and finely engineered choice. Pellco’s Palace and Transpalace walls glide smoothly along ceiling-mounted Aluminium tracks and ball-bearing trolleys. 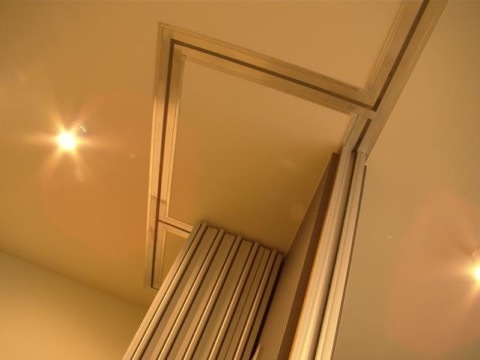 The tracks can even include corners in order to create shaped room divides or to allow for panels to be stacked remotely, out of the way when not in use. 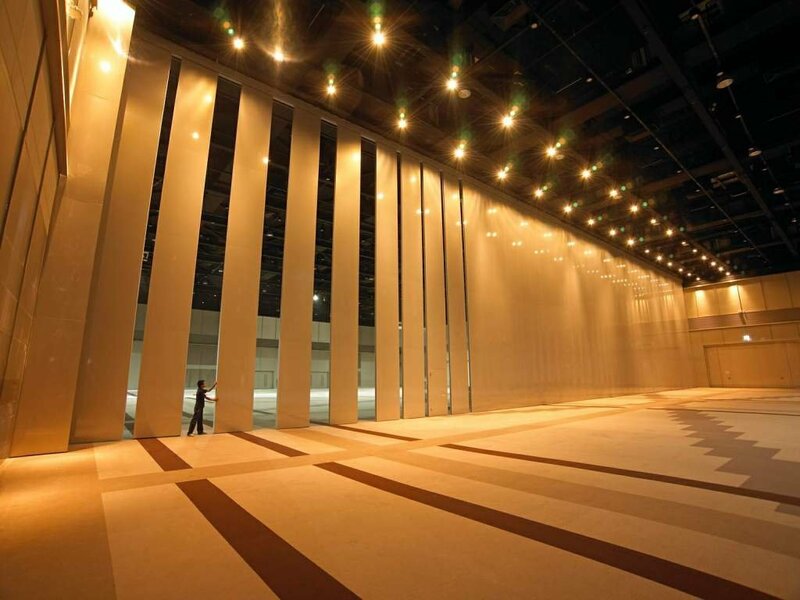 All Pellco movable acoustic walls comprise separate, large panels. 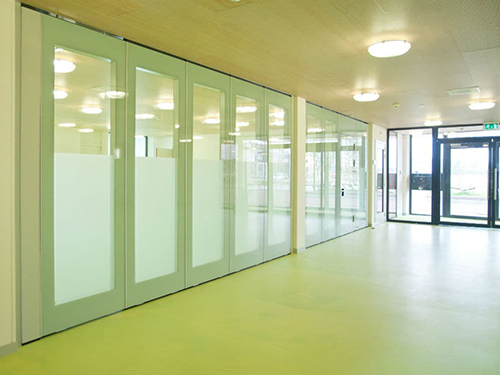 With over 40 years’ experience installing partition walls systems, we believe that separate panel systems have big advantages over continuous, hinged systems. With continuously hinged large panel partitions, when you pull the wall across the opening, it gathers great weight and becomes increasingly difficult to pull. Over time, the forces on the panel hinges and the trolley fixings can lead to separation of panels and damage to the trolley fixings. Also the constant stress on the wall abutment attachment can lead to it becoming damaged or detached. 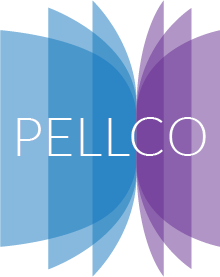 Pellco’s separate panel systems, on the other hand, offer long-term reliability, ease of use and stability. Because the user need only pull one panel at a time, wear and tear is much less. Additionally, individual panels can be thicker and sturdier, providing greater sound insulation, durability and fire resistance.